A daily-turned-weekly is finally saying goodbye to its town centre home after 132 years. Staff at the Scarborough News yesterday are moving from their historic home in Aberdeen Walk to a business park four miles from the centre of the town. Owners Johnston Press have sold the building and are leasing the new premises at Newchase Court on Scarborough Business Park, which is owned by Crown Properties (Scarborough) Ltd.
Advertising staff at the paper moved to the new base yesterday with editorial staff due to follow shortly. 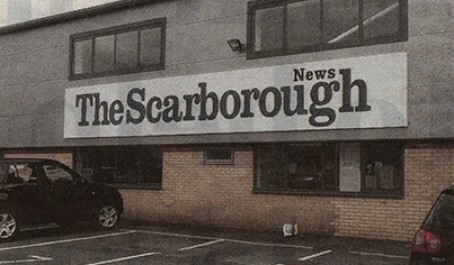 Scarborough News editor Ed Asquith said: “The new office will provide a much better environment for journalists, with a better reception and with parking for visitors which we don’t offer now. “There will be much faster digital speeds and presentation rooms for meetings with contacts. We will also have a base for reporters in the town centre. The sale of the old building In Aberdeen Walk came after HTFP revealed the regional publisher was looking to raise more than £8m from selling off current and former newspaper offices and ex-print works. The out-of-town move means reporters will have to make themselves available at specific venues and times to meet the public. In turn the readers have been told it can leave letters and reports at a newsagents near the old building. Look, I’m not getting sniffy about this, and Ashley Highfield has to somehow find the rent for the Central London HQ, but the new office doesn’t look that ‘exciting’ ‘smart’, ‘modern’ or ‘new’. In fact it looks the kind of place on a trading estate where you open a steel security grille, walk through an inner door that goes ‘beep, beep’ and talk to a guy behind a trade counter about tap fittings! As a quick aside, the contact page on their website doesn’t actually have an address listed, so good luck on trying to track down a reporter or snapper to have a good, old fashioned chat with. Note that the old office in Aberdeen Walk had a modest label suitable for a town centre shop, which effectively it was. 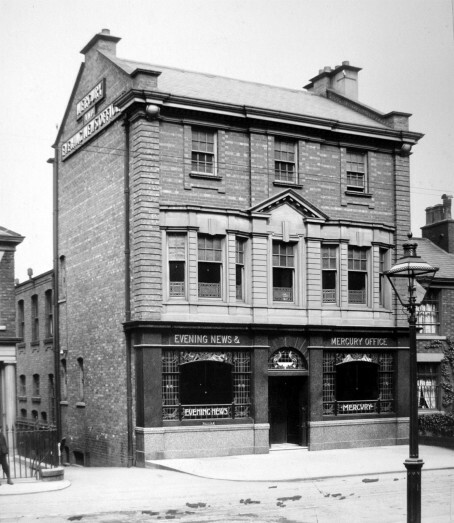 People would walk by & look in the windows and see that it was a newspaper HQ where they could do their business. In the new one…well, it’s no earthy use having your name six feet high on a shed if the public won’t be anywhere to see it, is it? Highfield & co should find a small town centre office of their own sharpish, not just a nearby newsagent. But I’m not hopeful – there are a lot of newspapers now who don’t seem to care whether the public know they exist! I hope there is a preservation order in place for the frontage of the Aberdeen Walk building. Some lovely old tiles. That’s Costa Coffee, is it? What is to become of the old place. Are the print works still there in the back? Who bought it? 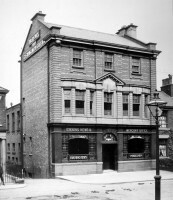 As oldscarboroughgand suggested I hope the towns civic society put in a request to her the building listed. it would have been interesting to know the future of the old place HTFP. Even with more work on the frontage, the new-to-you office is situated in a shabby industrial estate, with no passing traffic. As has been nicely pointed out – no point having your name six feet high on a shed. I’d hate to be stuck there all day, and I’m sure the local bakers, food outlets and retailers will miss TSN staff custom. There must have been better central offices that could have been rented. Yes, higher rent, but included in that is advertising The Scarborough News. Maybe, just as the locals get used to TSN not having a presence in the town, they’ll get used to not buying the paper. “Confused” has hit the cheese-head nail on the head with his trading estate description. What we should be told is that if the Scarborough News has taken over this trade building, where do we go for three-eighth washers? Johnston Press has flogged the building, in the middle of town, to local businessman Gary Ledden, who is leasing the firm new premises in the industrial estate – or ‘business park’ – four miles out of town. What is to become of the old offices? Who bought them? What are their intentions? Are the print works still at the rear? I agree the civic society should rush to have it become a listed building if it isn’t already. The local council in their infinite wisdom would probably allow it to be pulled down or remain vacant for a decade until it falls down like they do on a frequent basis. I was under the impression that all receptionists across the board were made redundant. Is this new building going to be manned by a receptionist or just purely for pre arranged meetings? Oh dear. Getting sentimental over the days when reporters living in area of papers and knowing it inside out were seen on the beat and were based in local office. Non local staff and out of town office equals paper without depth or soul. If it ain’t on an e mail it hasn’t happened. Hope JP handles this move better than some of the shambles their management has achieved. Some papers had to share offices with other papers. Paper in the middle of the community and at the heart of the community. Now on an industrial site. This really is shameful. Have been a lot of death knells for local print journalism (redundancies, content management systems, failure to adopt viable on-line business model, re-producing copy from local authority spin doctors, talent drain, the list is endless), and this is another one for scarborough. The tragedy is everyone knew which way the wind was blowing and a lot of staff, sadly, didn’t have the guts for a proper fight – not just to save their own jobs, but to save their newspapers and provide a public service. Am increasingly of the view that, given the utter failure of plcs like JP, newsquest etc etc, it would be better to have element of state funding. Appreciate this presents other problems (look how biased the BBC are in reporting referendum), but at least countries like France still have a vibrant press. Everyone knows print media doesn’t reflect what’s going on, which is why social media is winning for Team Scotland north of the border. I just feel sorry for anyone working in print media, with a few honourable exceptions (like the Sunday Herald – whose own staff are facing redundancies and strike action). Been out of the country and out of touch (mercifully). But it’s never too late to remind ourselves of the well-loved though increasingly inaccurate JP mantra, ‘Life is Local’. Local to what, Mr Highfield?